Need additional information on your hard hat? 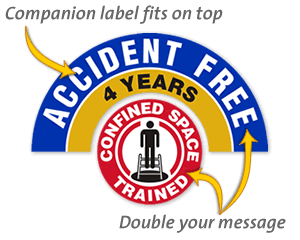 Double your message with Companion Hard Hat Stickers. The crescent stickers "fit over the top" of our standard 2" od circular labels. • Show different training certifications or reinforce a safety slogan. • Crescent Hard Hat Stickers are made from a patented 3M material that is highly conformable and can be applied without wrinkles. • Stickers can be removed/repositioned easily. • Suitable for outdoor use. Dirt, grease and water can be wiped off the smooth surface.